In one of the biggest — and briefest — jewelry heists in recent history, eight robbers at a Belgian airport made off with millions of dollars in uncut diamonds on Feb. 18. The robbery took place in under 11 minutes and not a single shot was fired. 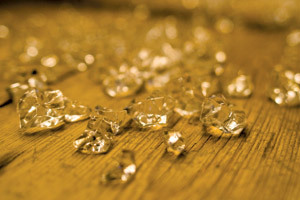 According to a spokeswoman for the Antwerp World Diamond Centre, where the stones originated, the thieves abducted around $50 million worth of diamonds. Other media sources in Belgium put the value of the stolen goods at closer to $350 million. The robbers targeted a shipment departing from the Brussels Airport, heading for Zurich. According to the Telegraph, the robbers cut a hole in the fence surrounding the runway and drove through only moments before the flight bearing the diamonds was scheduled to depart. The diamonds had just been placed on the airplane when the robbers arrived, carrying machine guns and blaring police sirens, loaded approximately 120 parcels of diamonds into their two vehicles. They then quickly drove off. The passengers on the plane did not notice anything was wrong in the three minutes it took for the robbers to steal the goods. Despite having located one of the getaway vehicles, there are as of yet no leads on the robbers themselves, nor the missing diamonds.